TS EAMCET Application Form 2019: Telangana State Engineering, Agricultural and Medical Common Entrance Test (TS EAMCET) is an entrance test conducted by Jawaharlal Nehru Technological University (JNTU), Hyderabad on the behalf of Telangana State Council of Higher Education (TSCHE). Aspirants seeking admission in the field of Engineering, Agriculture & Medicine can appear in this exam. To take TS EAMCET, candidates have to fill Telangana EAMCET Application Form. The form will be available online only. No other way will be provided to fill the form. The authority of TSCHE will also give an opportunity to correct the application form, if required within the correction period of application form. 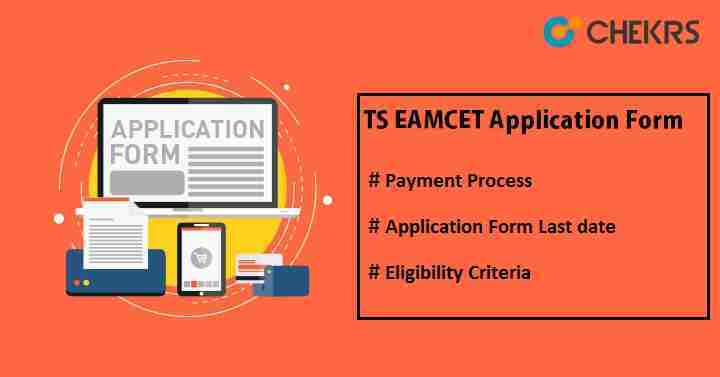 Here, we are sharing all details related to TS EAMCET 2019 Application Form, Application form last date, exam date and so on. Candidates are advised to go through the article and read all instructions carefully. Applicants should be Indian citizen. NRIs, OCI & PIOs can also apply for Telangana EAMCET application form. Aspirant should have domicile of Telangana or Andhra Pradesh state. Must have passed 10+2 with minimum 45% aggregate in marks (General) and 40% marks (reserved category) in PCM or PCB. Minimum age limit should be 16 years as or on 31 Dec, 2019. No maximum age limit will be there. Go to Notification. Click on “Apply Online”. Click on “Application Fee Payment”. A page will open, fill all the required details on the page, and select the mode of payment i.e. credit card/ debit card or net banking. After this, click on “Proceed to Payment” button. After this, payment reference Id will be generated and proceed to the application form filling procedure. For offline method, candidates have to visit nearby TS Online, AP Online, e-Seva, Mee -Seva centers. Give them all details like 12 Admit card no, Name, Father’s name, date of birth, mobile no and applying course with required fee. Take the receipt for registration fee containing Transaction Id. For payment verification, “click here if paid through TS Online, AP Online, e-Seva, Mee –Seva” button. Fill the all asked details in the application form like personal details, parent’s details, educational details, address etc. Choose exam center, and fill all necessary details. Upload the images as per given specification by clicking on “Select File” button. Click on the checkbox for declaration message. Click on “Confirm” button for final submission. After the submission, registration no will be generated on the screen. Please note down the no for further use. Click on “Print Application” and take the print-out of submitted application form.